"Wonderful race, beautiful morning, super crowd and volunteers! All for a great cause! I'll be back next year!" "Heartfelt thanks to everyone involved in putting this race together. It was fun, challenging, beautiful, and everyone was SO friendly! My very first trail race left me a bit sore and very tired but it also left me with great memories!! THANK YOU!" "That was one tough 5k! I was so surprised to be sore this morning. Great race, cause, and awesome awards!" "Fabulous race had a great time. See you agin next year." "That was a fun time - well organized, trails were marked good - did the 10K - dusty during the first mile until we got out of the wash area - then some great views, especially the Ocotillo forest around mile 3. Look forward to next year!" "One of best!! Great Course, great challenges, great scenery, and most of all great people with a wonderful purpose. Thanks so much, looking forward to next year..."
"Great race this morning. Congrats to those that helped organize this event. The volunteers were amazing. Runners were great. It was such a pleasure to finally meet a few friends. Good times. This was by far the hardest run I've ever ran. I didn't do as well as I hoped. That means only one thing...I'll be back next year. Cheers!" "Perfect day for a trail run. What a great little event. Very well organized and the 10K course was very challenging. We will be back next year!" "Great race today...beautiful weather!!!!!!!! loved that you had people out on the course I like to get lost and you didn't let me......fun will be back next year!!!!!!!!!!!!" "This mornings RUN WAS AWESOME!!!!!!! Thanks to all the volunteers who worked so hard to make it happen." "My husband and I ran the 10K, awesome challengiing trail run, grew up running in the desert and dont want to lose this beautiful area. Thanks to all the volunteers and the organizers, a great inaugural run ~ it was lots of fun! Will definately be back next year!!" 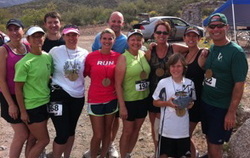 "I loved running the Cave Creek Trail 5K & had such a blast! Thanks for such an outstanding event!"